that was interesting. what is it that makes it 40x safer than the shuttle? i hate to think that we spent alllllll that money & time on the iss only to stop using it in just 20 years. who cares, when are we going to mars? i really really really want that framed picture of a gemini rocket with alllll those signatures they had on pawn stars yesterday. armstrong, aldrin, grissom, white, lovell, and a bunch of others. that'd be so damn awesome. I dont understand why they want to go back to the old capsule style? Is there a benefit to those? I would think at this point, 99% of Nasa's budget should go towards probes/Robotics and reasearch/equipment that can find out more about distant galaxies. Pretty sure that all falls under Nasa's umbrella.... putting more people in Space (Especially anywhere besides Mars) doesn't really do much for us, does it? "Pretty sure that all falls under Nasa's umbrella.... putting more people in Space (Especially anywhere besides Mars) doesn't really do much for us, does it?" Seriously. With what's out there in manned space flight, all we're doing at this point is shooting ourselves up into the sky only to return, like a super-duper expensive model rocket. Real space exploration needs to be done at the unmanned level. private enterprise. nasa is done, imo. they need to just give thier budget to commercial business. I'd like to see Wraith's take on this... NASA is continuing to develop the Orion crew capsule (albeit in a diminished capacity) and the US Congress has mandated the creation of a Heavy Lift Vehicle by this middle of this decade based on Space Shuttle and Constellation research/technology/supply lines/etc. In the mid-distant future, I would love to see more things like Skylon (which is being designed by a british company) come out of NASA... basically I'd love to see built what the shuttle was intended to be... safe, cheap, reliable workhorse. What ever happened to Virgin Galactic? I'm guessing they're still trying to make privatized space flight something that is feasible? I love astronomy, but don't really follow this aspect of the 'space' stuff, so I really can't comment on the future of it with any knowledge. I do think it'll be interesting to see how private and public manned space flight coexist in the future. If the private industry is doing it... you'd have to think NASA would get out of the business. That said, I don't see NASA ever letting private companies dock up to the space station and such. It sounds like private companies are just aiming to take you to the 'edge of the atmosphere' and fall back down shortly thereafter. suborbital flights might spur fast transportation at some point, but right now it looks like mainly a space tourist thing. I wouldn't want to be on the first 10 flights of any new system. After that, everything's cool. Less than a few hundred yards from Space Shuttle Endeavour on Pad 39A. Here you see my pretty face. Unfortunately the pad was closed around the orbiter so that they could do work on it so you can only see the ET and SRBs. It seems to me that the Skylon space plane is a little too advanced to be feasible within the next few years. The amount of thrust (and fuel) needed to launch a craft into orbit is just too much for engines like that, and even more the angle of insertion and a number of other factors make things very difficult. It's definitely possible, it would just take a lot of design and development. To answer se7entythree's question, it looks like it would be safer because it uses jet engines (at first) rather than rockets. Jet engines are a lot less likely to explode. Furthermore it looks like the crew hangs out in the cargo bay during liftoff meaning that in the event of catastrophic failure the crew compartment could probably be ejected. Keep in mind though that the two space shuttle failures that have occurred weren't due to design faults of the actual orbiter, they were due to faults in the SRBs for Challenger and external tank for Columbia. Alfgard, the reason we are going back to capsule design is because we are trying to leave Near Earth Orbit (NEO). The space shuttle only ever goes about 200-300 miles up and stays orbiting Earth the entire time. 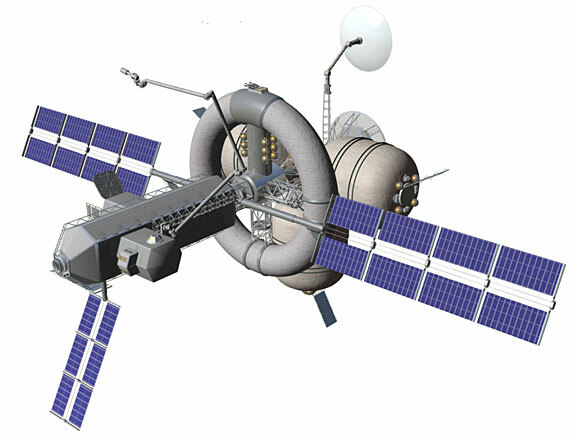 Capsules are designed to leave Earth's gravity completely and head towards the Moon, Mars, asteroids, deep space, etc. They are alot smaller and therefore are lighter, cheaper, more reliable, and can use gravity assisted slingshots a lot more effectively. PackBacker and Madman, we aren't just shooting astronauts into space for nothing. Even if we were to just use robotics and probes, people would need to go up into space for maintenance and stuff. People will need to be in the ISS to support missions like that. The level of robotics that humans have developed right now aren't nearly as intelligent as the human brain. Additionally, if we ever do intend to go into deep space, we'll need somewhere to start. Regardless of what NASA does anyway, the private sector will be sending people up in the next five years or so. Also PackBacker, don't be too surprised if some private companies do end up docking to the space station; NASA won't have a crew launch vehicle for a number of years and right now once the space shuttle has been retired, our only option for getting American astronauts to space is buying seats on a Russian vehicle. We'd much rather be paying American space companies for that kind of thing so as soon as the private sector starts releasing reliable/successful man-rated launch vehicles, NASA will be putting astronauts on them. Anyway, so luckily all my work on Ares wasn't in vain. Some of you space geeks may have heard that ATK has bought the Ares I stuff from NASA and they intend to create their own "Liberty" launch vehicle that looks almost exactly the same but with a different crew capsule. Heavy Lift (or SLS as we call it) has been approved and will probably end up being man-rated which is good news. Work on it has already began in my branch so now I'm splitting my time between that and some satellite work. So yeah, sorry for all the words. Let me know if you guys have any questions about stuff. am i off target wraith? i used to be all up into this stuff. i'd like to get into it professionally, but the uncertainty of the program has me wary. Shoot, I was going to say something that was going to revolutionize this thread. Then I got an egg and forgot. do not post eggs during the egg hunt. "Keep in mind though that the two space shuttle failures that have occurred weren't due to design faults of the actual orbiter, they were due to faults in the SRBs for Challenger and external tank for Columbia." yeah. i've been reading every book i can get my hands on about columbia right now, and have read 1 that covered a lot about challenger, although was not explicitly about it. more specifically, the o-ring in the srbs for challenger & the damage to the left wing due to foam shedding for columbia, and massive mismanagement/disorganization/neglect from nasa on both. i <3 <3 <3 reading about the technicalities of all this stuff. thanks for the explanation. "Add me on Facebook if any of you wanna see some more random behind the scenes pictures of various NASA crap." i'd like to add you on fb. what's your name? pm if you want. thx! seems like a long shot, although it sort of makes sense as a way to transition to private space systems and to bridge the gap between the NASA retirement of the shuttle and other available human rated orbital systems. Can I somehow praise the fact that smc hasn't graced this thread yet without summoning him? Also, jealous @ Wraith. ^^The likelihood of the shuttles flying anymore than their final missions is highly unlikely. If they had put a bid in for them a few years ago it might have been more possible but it's just too late for that now. ^i agree. hasn't there already been a shutdown of several key assembly lines, such as the fuel tanks? They assemble them in Michoud Assembly Facility in Lousiana and I think they might be developing a backup ET for the June launch but that's about it. When I was in the VAB yesterday they were prepping the ET tank for the final shuttle launch... you can actually see parts of it in some of my pictures. "PackBacker and Madman, we aren't just shooting astronauts into space for nothing. Even if we were to just use robotics and probes, people would need to go up into space for maintenance and stuff. People will need to be in the ISS to support missions like that. The level of robotics that humans have developed right now aren't nearly as intelligent as the human brain. Additionally, if we ever do intend to go into deep space, we'll need somewhere to start. Regardless of what NASA does anyway, the private sector will be sending people up in the next five years or so. " Still, while I agree that it's always important to maintain our maintenance capabilities for the space station and always improving human space travel capabilities to an extent, Madman and I were more referring to the fact that it seems 'more of the same' for human travel in space. We don't seem to be sending a human to Mars any time soon, so I'd think in this type of economic climate, we'd focus more of the limited $$$ on probes considering the success of Voyager 1, Spirit and Opportunity, etc. I will concede that I understand why we're still sending folks to the space station and such.... I'd just allocate the funds to be about 95% to 5%, personally. So do you work at Nasa or something? Awesome photos. ^Yep I work at NASA Marshall Space Flight Center but right now I'm down at Kennedy for work. Yep that's mostly true. The high-drag side of the capsule is a lot smaller than the high-drag belly of a space shuttle so less area = less heat absorbant tiles = more time can be spent making sure each tile is absolutely perfect and every square millimeter is accounted for. Also in the event of catastrophic failure, a crew module will have a Launch Abort System that will carry the astronauts to safety. The shuttle didn't really have anything like this except in STS-1. ^Extended duration version "Nautilus X"
granted, it's just a hypothetical vehicle, but it looks like the damn prototype for the Discovery One ( ship on 2001: A Space Odyssey)... all it needs is a nuclear powered drive. About centrifuges...how in the world do you get into and off of that section of the station that's rotating? My only guess would you'd have to stop the spin for anyone to get on or off. Or have another ring just outside that spins independently of the main ring that you can get on, then spin that up to the same speed as the main ring. ^^you climb down the ladder in that connecting tube. the whole section looks like it spins. For the centrifuge you could just enter through the middle (obviously no centripetal forces in the center) and climb through the midsection. What kind of propulsion system does it have? Since it is a space only vehicle, I'd assume it was require some kind of lander if astronauts were planning on going down to a terrestrial body. lol I immediately thought of 2001: A Space Odyssey too. It would need a HAL9000 though. i guess it could use a variety of propulsion modules... ion... nuclear... chemical... whatever the mission called for. if you have an extra $150,000,000, you might be one of the ones to go! 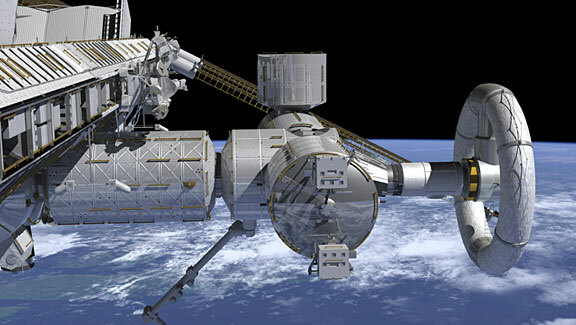 Future of manned space flight is commercial and reuseable aircraft. Future of unmanned space exploration is governmental agencies and rockets. Russian/Private moon mission could happen as early as 2015! This would be the first time humans have returned to the moon since apollo ended in the early 70's. The soyuz capsule would launch and spend 10 days at the ISS, and then another craft with a larger habitat module would launch and the soyuz would dock with it, making the vehicle much roomier than the apollo capsules. ^yeah that's exactly what I was thinking. NASA already has 60 years of spaceflight experience and tons of data/databases/etc. Our direction is changed like every time a new president comes in anyway. If manned spaceflight/exploration is to ever advance with the same rapidity that other areas have, it will be done by the private sector. Not only would that encourage financial collaboration on an international scale, but it would introduce competition - something that is conspicuously missing from the current, state-run model. I do agree with the part about Cold War II starting and a need for inspirational and cutting edge space programs to encourage students to excel in science and math. After long last, Spirit is dead. "If manned spaceflight/exploration is to ever advance with the same rapidity that other areas have, it will be done by the private sector. Not only would that encourage financial collaboration on an international scale, but it would introduce competition - something that is conspicuously missing from the current, state-run model." what is the major motivation for the private sector to suddenly dump billions of dollars into R&D? Tourism? Moon rock?